Showing 1 - 20 of 152 results. A page banner promoting an article about The Concert. 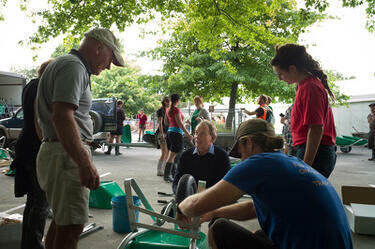 Members of the Student Volunteer Army assembling wheelbarrows in the UCSA car park. 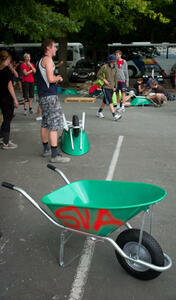 The wheelbarrows will be used to clear liquefaction from Christchurch properties. 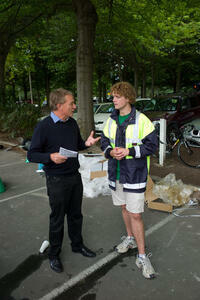 Labour Party leader Phil Goff speaking to members of the Student Volunteer Army as they assemble wheelbarrows in the USCA car park. 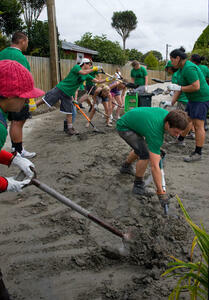 The wheelbarrows will be used to clear liquefaction from Christchurch properties. 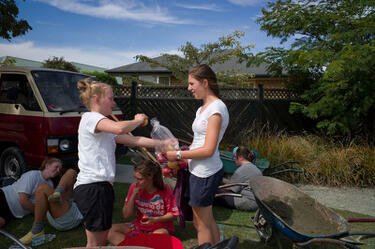 Student Volunteer Army members from Riccarton High School on a break from clearing liquefaction from Christchurch properties. 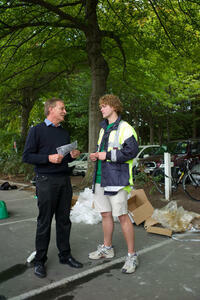 Labour Party leader Phil Goff speaking to Student Volunteer Army organiser Sam Johnson in the UCSA car park at the University of Canterbury. 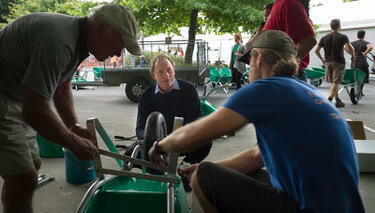 Former Labour Party leader, Phil Goff, talking to students assembling wheelbarrows for the Student Volunteer Army at the University of Canterbury. The wheelbarrows will be used to clear silt from Christchurch properties. Members of the Student Volunteer Army digging up liquefaction in from a resident's property. The liquefaction is being placed in wheelbarrows where it will be transported to the street and left in piles for the City Council to pick up. Photograph captioned by Neil Macbeth, "Members of the Student Volunteer Army clearing liquefaction in earthquake-ravaged Avonside. The Student Volunteer Army are mostly University of Canterbury students who are helping to clean up the liquefaction from Christchurch properties. 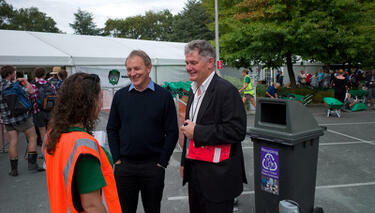 Labour Party leader Phil Goff speaking to members of the Student Volunteer Army in the UCSA car park outside the UCSA's "Big Top" tent. The tent was erected to provide support for students at the University of Canterbury in the aftermath of the 22 February 2011 earthquake. Behind them members of the Student Volunteer Army are assembling wheelbarrows which will be used to clear liquefaction from Christchurch properties. 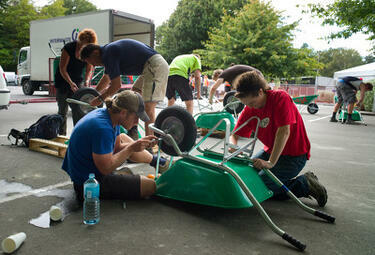 Members of the Student Volunteer Army assembling wheelbarrows in the UCSA car park at the University of Canterbury. 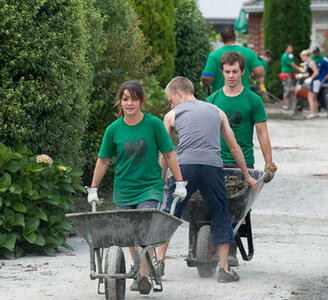 The wheelbarrows will be used by student volunteers to clear liquefaction from Christchurch properties. They have been spray painted with the Student Volunteer Army's so that they are not confused with those the students have brought themselves. 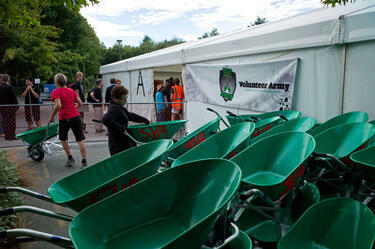 Wheelbarrows belonging to the Student Volunteer Army stacked up outside the UCSA's "Big Top". The tent was erected to provide support for students at the University of Canterbury in the aftermath of the 22 February 2011 earthquake. Members of the Student Volunteer Army leaving the UCSA car park on their way to clearing liquefaction from Christchurch properties. Student Army leader Sam Johnston and Patsy Te Are lighting a flame to signify the presence of God at the Christchurch Earthquake Memorial. 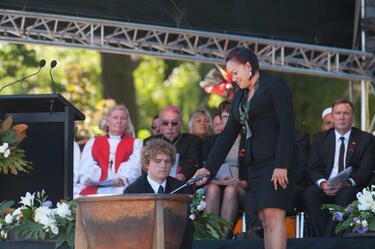 The service was held in Hagley Park on 18 March 2011. 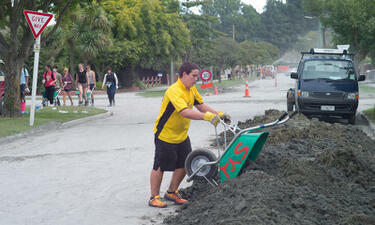 A member of the Student Volunteer Army using a wheelbarrow to pile liquefaction on the roadside for collection. 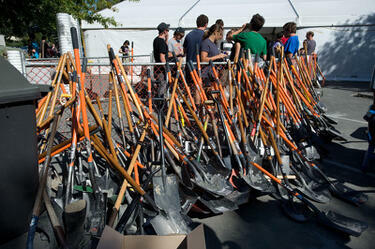 A collection of shovels from the Student Volunteer Army in the car park of the USCA. 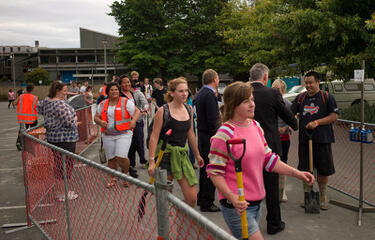 The shovels have been returned by students after a day of clearing liquefaction from Christchurch properties. Behind them the UCSA's "Big Top" tent can be seen, which was erected to provide support for students at the University of Canterbury in the aftermath of the 22 February 2011 earthquake. 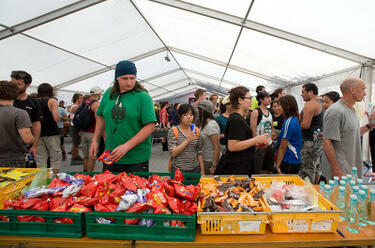 Members of the Student Volunteer Army helping themselves to free snacks inside the UCSA's "Big Top" tent. The tent was erected to provide support for students at the University of Canterbury in the aftermath of the 22 February 2011 earthquake. 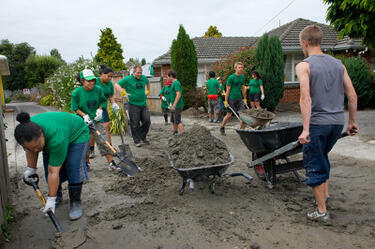 The volunteers have returned from a day of clearing liquefaction from Christchurch properties. 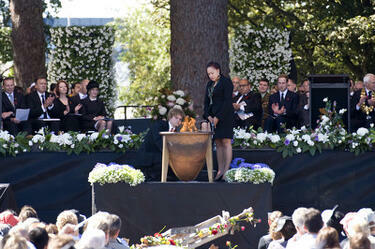 Student Army leader Sam Johnston and Patsy Te Are lighting a flame to signify the presence of God at the Christchurch Earthquake Memorial Service in Hagley Park.